Prime Minister Tun Mahathir Mohamad, who won in last week’s historic Malaysian GE14, had promised during the campaign to abolish the 6% GST to reduce the citizen’s financial burden. Just yesterday, the Malaysian Ministry of Finance has released an official statement of 0% GST charges from 1 June 2018 onward. The statement suggested that all registered business owners to follow the zero-rate imposition by adjusting all goods and services’ price to comply with the Price Control and Anti-Profiteering Act 2011. 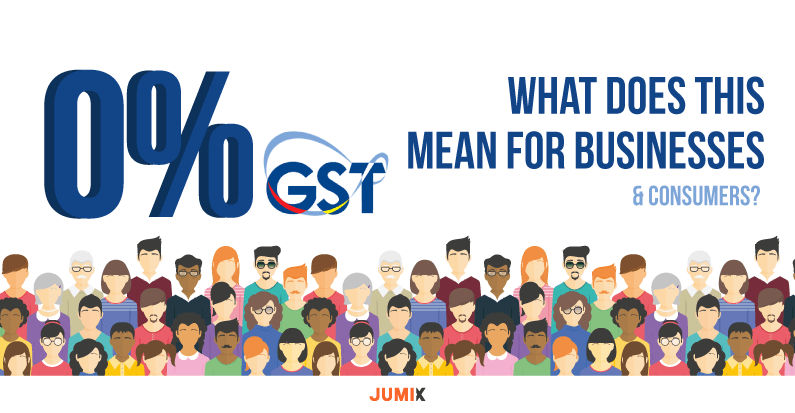 But what does this mean for business owners when GST charges are not being abolished entirely but reduced to 0% GST instead? Should You Still Show GST in Invoice? Given that the Goods and Service Tax (GST) has only been zero rated and not scrapped entirely, this does mean according to the current documentation regulations, business owners will have to show a 0% GST charge on tax invoices. The executive director of Grant Thornton Malaysia, Alan Chung claims this to be a “smart” move. According to Chung on his interview with The Edge Financial Daily, zero-rating GST will allow transitional issues to be smoothed out. Enabling taxpayers to have six years to claim their input tax credit and a lot of them may not have the proper invoice now to claim them. Chung addressed that this period also depends on how long the government maintains the GST legislation. Despite reducing the GST to 0%, an enactment of SST will be implemented in future. However, the date of implementation is yet to be announced as this will be a series of Parliament sitting to legalize SST once again. Meanwhile, consumers should be able to expect a reduction of prices in sales and goods for at least 6% starting from June 1 but there is an expected increase in price after SST is being reintroduced. Given that the GST legislation can’t be removed overnight, we recommend businesses to comply by registering their business for GST if its’ annual turnover is over RM500K. Keep 0% as GST charge until this legislation has been lawfully removed. Get advice from the custom during registration for best advice. Send a courtesy mail to all your customers regarding the change to notify that prices have been amended due to the new change. Get in touch with your accountant or tax agent for further clarifications or issues arise during this transition period. 2. Go to Setting, Localization, find Tax rate (GST) and change the 6% to 0%. Planning to go make your business go digital now because of lower cost? Get in touch with us today! Witness a decrease of price over price of goods and services of approximately 6% from June 1 onwards! Keep yourself updated on the new change to avoid any misunderstanding, as it is believed that there might will be some hiccups over this transition period. This historic GE14 win has taught Malaysians many, we are all heading for change but first, change has to start from yourself. As business owners and consumers, let’s work hand in hand with each other and the newly elected government to embrace positive changes for a better Malaysia. We’ll continue to update this post should we receive any further instruction and clarification from relevant parties.